I am a home user and have a hard time justifying a $100 font manager. That said, I have around 1300 fonts installed and was hoping for an easy way to activate and deactivate by collection. 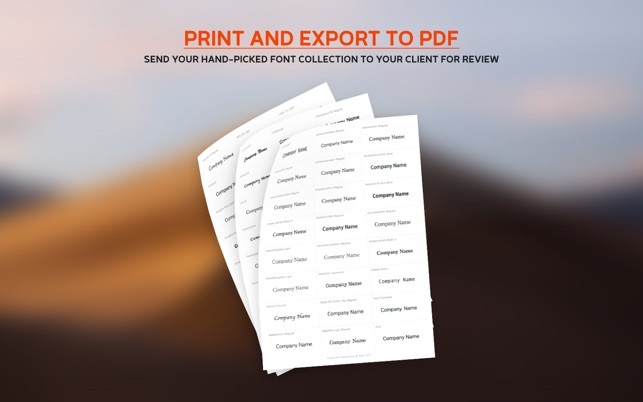 Font Book for me runs extremely slowly, even though I have no problem in programs like Photoshop CC and Lightroom. Typeface will only run as fast as Font Book. I spent a lot of time making collections in Font Book and while Typeface will read them, they must be activated for Typeface to show them in their collection. 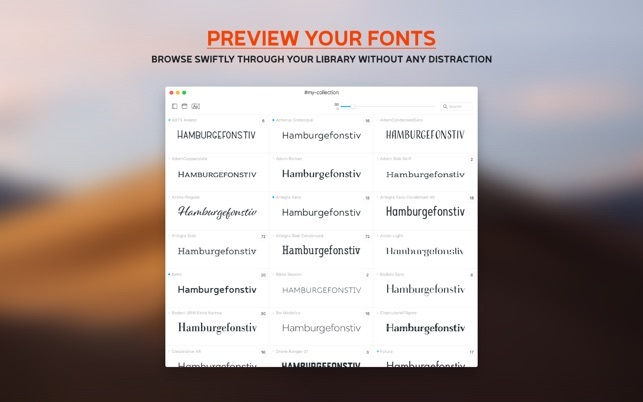 If you have deactivated the fonts to speed up your system, then you can only reactivate them by going back into Font Book itself, or remember what fonts are in each collection and individually reactivate them. I deactivated a collection in Typeface, and when I went to Font Book, all the fonts had been moved out of the collection entirely, so now I have to rebuild it. The filters are not that great, either, unfortunately. The Script option pulls up nothing that is actually a script, but fonts like vintage typewriter fonts and Marker Felt. I was really hoping for more. Perhaps if I had less fonts and wanted to keep them all activated all the time it would be better for me, but I think I just need a more robust program. Font Display, Organization And Use Are A Breeze! 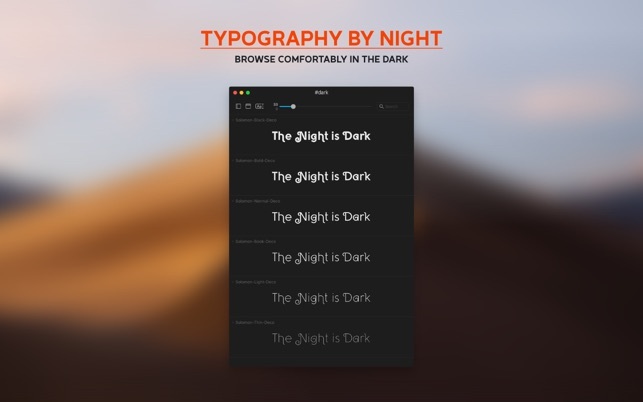 I couldn’t be more pleased with this font management app! As a Graphic Designer, one of the projects I work on regularlly is for apparel designs/ecommerce DTG or screen printed products. Every design has to be completely different from the next to ensure originality. Typeface enables me to load an enormous collection of fonts with ease, categorize them in a way that works best for me and then to see them in a snap. I love that I can see exactly how each typeset word or sentence will look before choosing the best font. I also cannot say enough about the customer service. When I’m really stuck and cannot figure out how to do something, I simply send an email with my questions or concerns and receive an informed response shortly afterward. The value you receive with this app is unbeatable in my opinion. I asked several other graphic design colleagues who recommended this product to me. 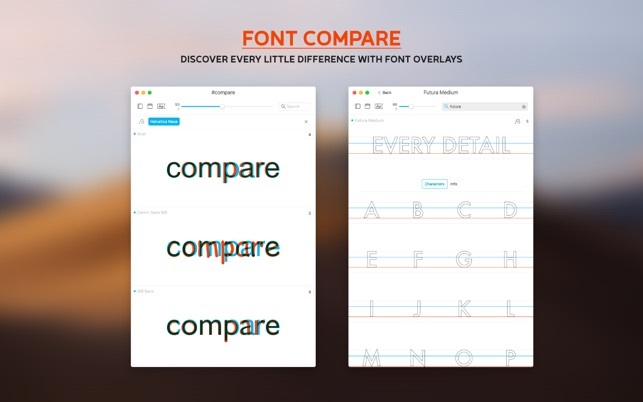 It’s no wonder they chose Typeface, it’s a fantastic app! 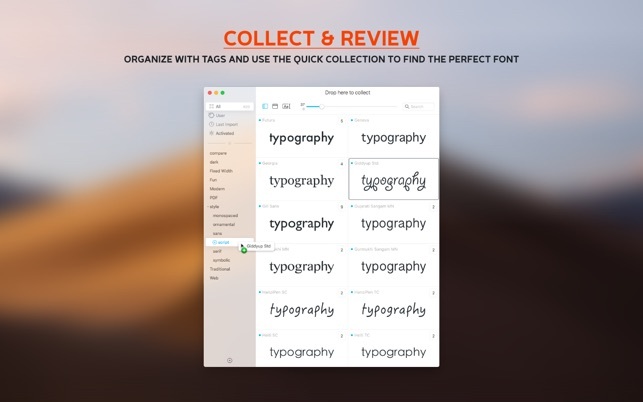 Overall, typeface is a beautiful, fast font manager, and well worth the $10 pricetag - just don’t uninstall that freeware manager in the meantime.